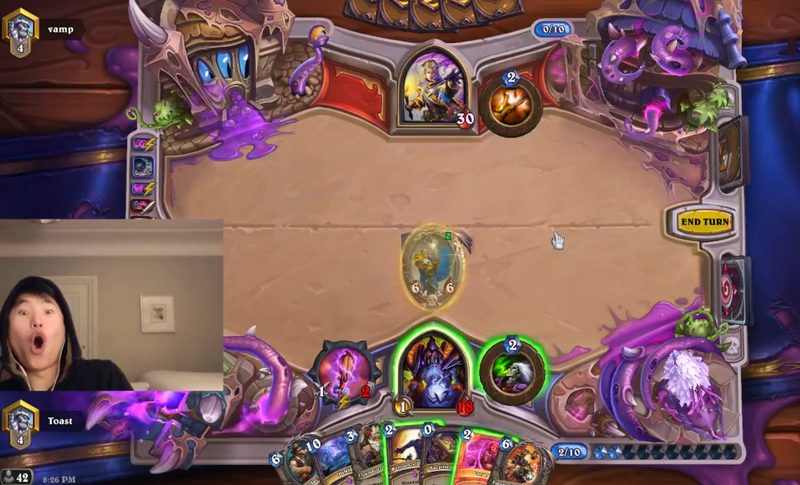 Disguised Toast did nothing to disguise is joy and disgust at a particularly torturous turn of luck during last night’s stream. 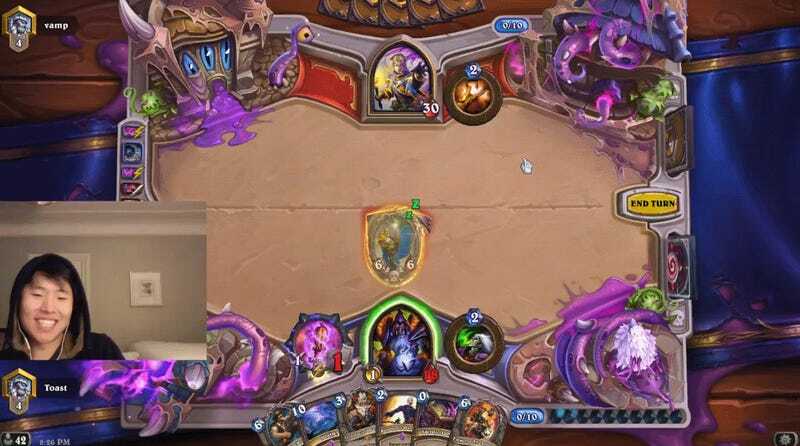 Soaking up damage throughout a match against a Priest deck, Toast finally unleashed Twisting Nether to clear the board and relieve some pressure. He also had Atiesh equipped, a weapon that summons a random minion of equal mana cost when the player casts a spell. Doing so landed Toast with Tirion Fordring, a legendary minion with a number of buffs that also gifts the player a 5/3 weapon when it dies. But that excitement was short lived since the same bit of RNG luck that gave him an edge also took it away moments later when Toast decided to get rid of a Cursed he’d been holding. Playing the card could have summoned any two mana minion, but in this particular moment the Hearthstone gods decided it should be none other than Doomsayer. Doomsayer, a minion that destroys everything on the board at the start of your next turn, meant that Toast would never get to deploy the Tirion Fordring against his opponent. Even worse, because his Atiesh would be replaced by the Ashbringer, he’d lost his opportunity to turn the Doom he was holding into a random ten mana minion. There was always a chance that Doomsayer might be summoned, and given what he had to lose if it was, Toast could have pursued a number of other options. In the end it didn’t matter. Playing Reno several turns later to restore himself to full health, Toast had the ammunition to eventually pummel his opponent into submission. Still, the match was a reminder of Hearthstone’s penchant for ridiculous RNG moments. And Toast himself is no stranger to them. Just remember, Doomsayer is out there and ready to spoil all your fun whenever it can.